Olaf Boehnke is senior advisor, Berlin at Rasmussen Global. Merkel’s CDU was beaten by the Social Democrat SPD in Lower-Saxony, causing her yet more headaches within her own party, and forcing her to take a step back from the European stage as she seeks to regain domestic initiative. Mrs Merkel is in no way ready to draw her pension; there is no obvious successor in sight. However, with this weekend’s election defeat coming so soon after the general election disappointment, she is gradually seeing her once-formidable power ebbing away. German politics is going through a transformation, with people losing trust in the safety-first approach of “Mutti” Merkel. While Social Democrats sighed with relief last Sunday, the leadership in the CDU’s headquarter might have groaned with pain. The so-called Jamaica coalition talks with the Greens and Liberal FDP are consequently becoming more difficult for Angela Merkel as her own CDU party begins to doubt her ability to play her weak hand to their advantage in the forthcoming coalition talks which begin on Wednesday. Inside her party there is not a process of open criticism or even a coup, but rather a silent, in-depth tremor at the bottom of the sea. It is too early to say if it might turn into a political tsunami, but for the first time in her term as head of government, she seems to be susceptible to blackmail, as she is condemned to turn this Jamaica experiment into a capable coalition. With the Social Democrats retiring to lick their wounds on the opposition benches, there is no other way – without new elections – to deliver a workable majority. And beyond all doubt, both the FDP and Greens will drive a hard bargain for their support. However, the real obstacle for Mrs Merkel is her own party, and especially her Bavarian sister party, the CSU. Given their brutal losses in the general election, the party is trapped in its own identity crisis. They are asking internally whether they need new leadership of their own with Bavarian elections coming up next year. And should their policy platform seek to copy Sebastian Kurz in Austria who managed to steal some extremist votes by wearing some of their political clothes during the campaign? Analysts and pollsters are flagging scepticism among CDU/CSU ranks towards such an option. Against this worsening backdrop, the Jamaica coalition looks increasingly difficult for Mrs Merkel. The German people are not an obstacle: 59% of Germans according to a survey by ARD want to see a Jamaica coalition formed, but both the potential partners of the Greens and FDP have already seen their own vote-share fall in this weekend’s elections, already leading some figures to ask if they have become tainted by Mrs Merkel. The FDP’s previous coalition with the CDU resulted in their total wipeout at the following Bundestag elections. Consequently, potential coalition partners are beginning to fight for position in the future coalition, even before the talks begin. Already, FDP vice-chairman Wolfgang Kubicki has told Der Spiegel that Germany should rethink its commitment to the European sanctions on Crimea, and he criticised NATO’s presence in eastern Europe as a provocative act against Russia. His boss, FDP chairman Christian Lindner, went even further ahead of the European Council later this week. 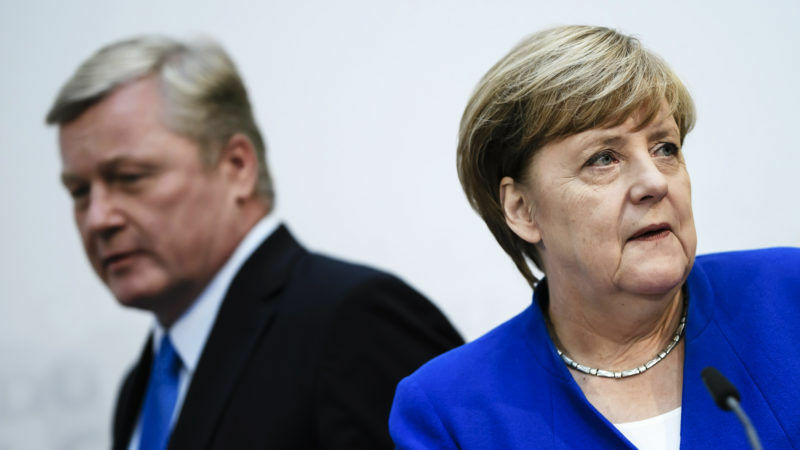 In an interview with Frankfurter Allgemeine Zeitung on Tuesday, he stated in no uncertain terms, that he expects Mrs Merkel not to make any substantial concessions in Brussels as long as the coalition negotiations in Berlin are ongoing. Mr Lindner was particularly referring to President Macron’s proposals for re-igniting the European project including further eurozone integration with a common budget and powerful finance minister. Both ideas are strongly contested by the FDP. For Brussels, this means Mrs Merkel’s reign as de facto leader of Europe may have to take a backseat as she tends to her own back yard. Never underestimate her ability to play a bad hand with utmost skill; she is no neophyte. However, for the European summit this week, we should be prepared for Mrs Merkel to be more focused on Berlin that she has been on Brussels, and when she does come to Brussels, her ability to play an active role will be very much constrained by the two coalitions she must navigate: the one in her party, and the one in her government.